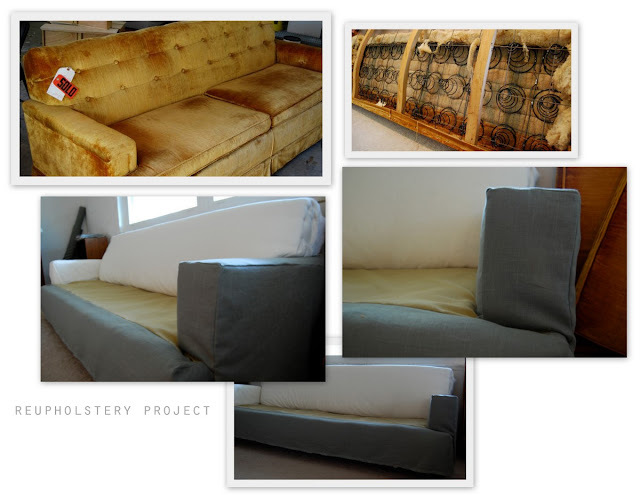 So remember that little couch reupholstery project I started oh, six months ago or so....don't get too excited it isn't quite finished yet but I'm finally making real progress and I am so excited with how it is turning out. I finally ordered the fabric and it arrived about a week ago and it is beautiful...exactly what I had in mind when I began this project. On Sunday I started making the first cuts on the fabric (so nervewracking!) and little by little each night I am adding a new piece to the couch. I'm making some minor adjustments to 'modern' it up a bit and I honestly can't believe how easy it's been up to this point. Here's a quick look at how it's going. I haven't attached any of the pieces to the frame yet but you can get the idea of how it will look.